The town has decided to form a new committee to deal with accidents involving town employees after a number of Houlton Ambulance Department crashes in the last two years. 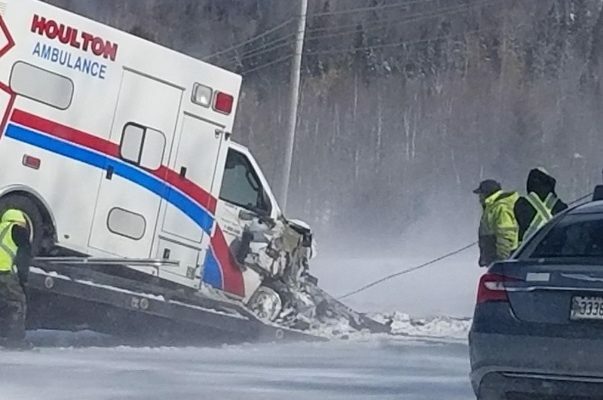 HOULTON, Maine — The town has decided to form a new committee to deal with accidents involving town employees after a number of Houlton Ambulance Department crashes in the last two years. Councilor Bill McCluskey raised the issue during the councilors comments portion of Monday’s regular council meeting. “I would like to know when we are going to get a report from the [fire] chief via the town manager about what we are going to do about preventing another ambulance accident,” McCluskey said. Town ambulances have been involved in four accidents since 2017. Town Manager Marian Anderson said Tuesday that she is not sure how much damage was done to the vehicles during the crashes, especially since one of them just happened last week. Poor winter road conditions, driver inattention by other motorists, and animals in the roadway have been contributing factors. The latest crash occurred on April 4, when an ambulance responding to an accident in Bridgewater could not stop on the icy roadway and drove into the rear of a stopped car before sideswiping another vehicle and going off the road, according to the Maine State Police. In February 2018, an ambulance sustained extensive damage after striking a Maine Department of Transportation plow truck on Interstate-95 near the Stillwater Avenue exit in Orono. In June 2017, an 83-year-old man crashed into an ambulance responding to an emergency in Houlton. In September 2017, an ambulance transporting a patient to Northern Light Eastern Maine Medical Center in Bangor, struck a moose on Interstate-95 near the Alton Bog. Anderson said that she met with Fire Chief and Ambulance Director Miton Cone to discuss the situation and he suggested reinstituting an accident review committee, which once existed in the town. Committee members would review all accidents involving municipal employees, whether they involved vehicles or not. The committee would review accidents involving any and all departments in town. According to the American Ambulance Association, there are 4,500 vehicle crashes involving ambulances per year, with 34 percent involving injuries. Thirty three people per year are killed in ambulance crashes. Anderson said she will put a committee together, but anticipates town employees also will be involved in reviewing the most recent accident and any going forward.